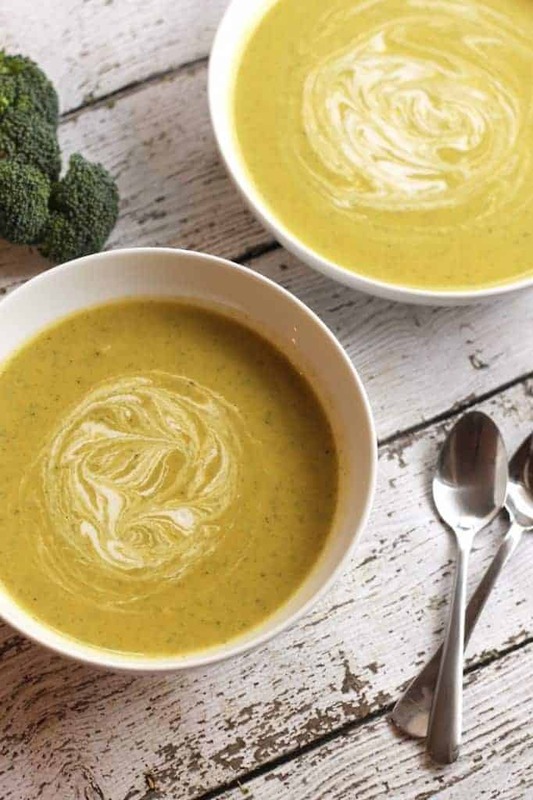 The creamiest, healthiest Vegan Cream of Broccoli Soup there ever was…comfort food in a bowl! Would I ever lie to you? Is the sky green? Is hummus disgusting? I wasn’t fibbing when I I told you these black bean brownies taste nothing like beans. Or that this double chocolate ice cream most definitely does not taste like an avocado party in yo’ mouth. Or when I said that people would think you were joking if you admitted there was quinoa in these strawberry oat bars. And the fact that these gingerbread blondies are made with chickpeas?! GAHHHHH you’d never know!!! I am the Lorax Hummusapien. I speak for the trees superfoods. I speak for the superfoods for the superfoods have no tongues. And the truth is that this Vegan Cream of Broccoli Soup is the bees knees. I made three batches in a row for Alchemy’s soup of the day, but I made so much that I honestly had no idea how to scale it down to non-restaurant proportions. When I make soup, I hardly ever measure anything or write down what’s in it. This time I swore I would record everything because there was no way I couldn’t share this creamy, dreamy, broccoli beauty with you. Want to know the secret? Okay. It’s cashews. They’re like spanx. Or truffle oil. They make everything look and taste and feel so much better. 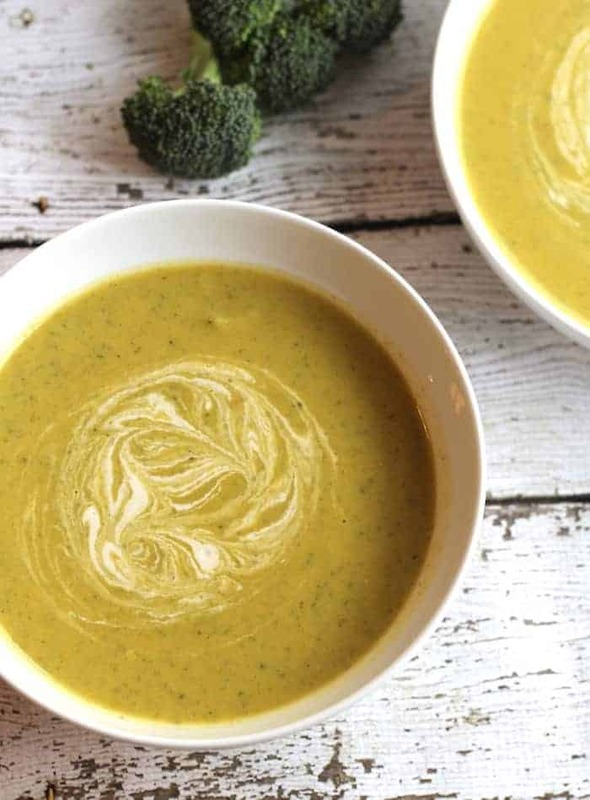 They are the KEY to this insanely delicious Vegan Cream of Broccoli Soup! There really is no substitution here for cashews, my friends. I say this because I know I’m going to get asked. It would be like trying to make brownies without cocoa powder or scrambled eggs without eggs. It’s just not really possible. 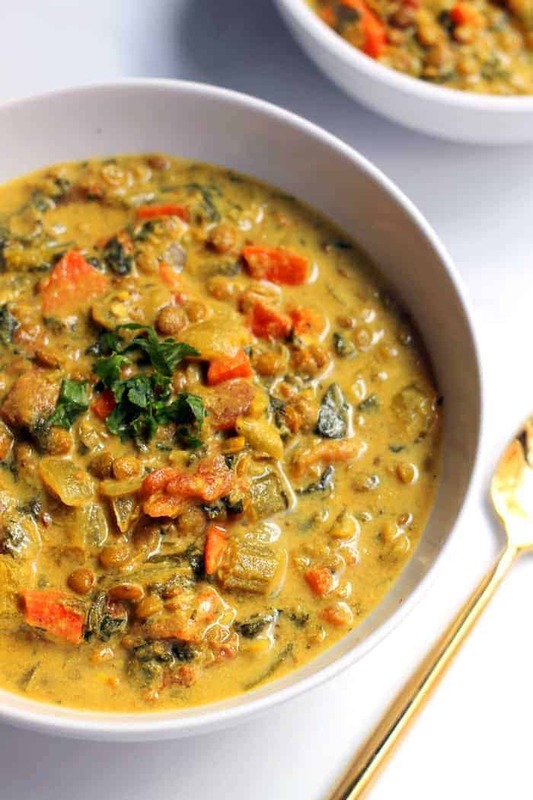 So if you’re allergic to nuts, go make this lentil soup instead. Seriously. It’s nut-free and super tasty! I’m noticing that ever since my boyfriend and I broke up, I’ve been more into food than ever. Maybe it’s because now I can spend all my free time cooking and eating and then writing about what I cooked and ate? WOAH did this post just get a little personal?! Moral of the story…I’m may just marry this easy Vegan Cream of Broccoli Soup. You’re all invited to the wedding. Add oil to a large pot (I used my dutch oven) over medium high heat. Once hot, add onion and a pinch of salt and sauté for about three minutes. Add celery and carrots and sauté for another five minutes. Add garlic and broccoli and sauté for another five minutes. Add 5 cups water, salt, and pepper. Stir and bring mixture to a boil. Once boiling, reduce heat to low and simmer, covered, for 15 minutes. Drain cashews. Place cashews and 1 cup water in a blender (I used my Nutribullet). Blend until very smooth and creamy. There should be no clumps. Set the cashew cream aside. Puree soup using a large blender or immersion blender. You’ll likely have to do this in batches. Once soup is pureed, stir in cashew cream. Season to taste with additional salt and pepper, if desired. 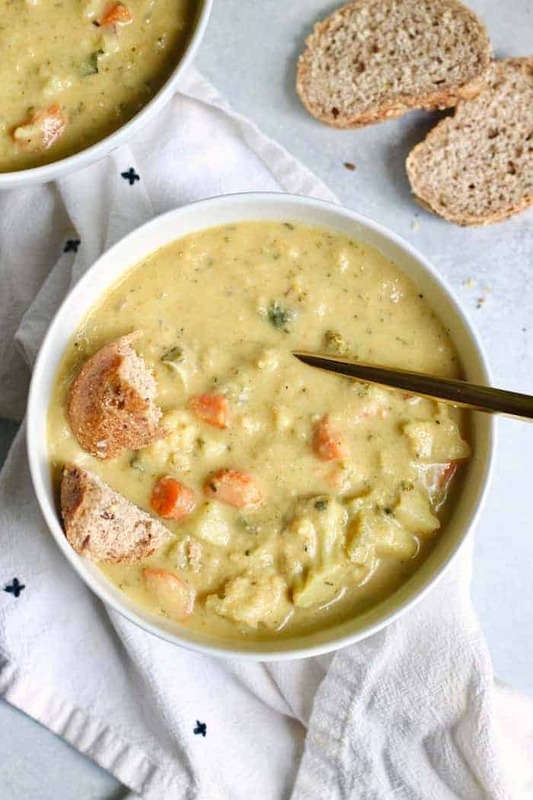 love the backdrop/photos of this post…and the soup, you have convinced me to make it this week. This recipe looks fabulous! I think you are totally right about cashews. Somehow you’ve convinced me to eat this soup and I don’t even like broccoli cheese soup. Are you magic?! I can’t think of a better spokesperson for the superfoods than you, m’dear. Everything I’ve tried of yours is fan-freaking-tastic so I definitely trust that this is the best broccoli soup that ever was! A lil’ cashew creamines??! Suh-lurp! You’re the greatest, and I think you’d die and go to soup heaven if you laid mouth on this. IT WAS MEANT FOR YOUR FACETRAP!! Oh my goodness I need to make this asap. You just get me, Alexis. I hope you fall in love! how delicious! It is snowing here… I could so go for some of this! It was a level one snow emergency here so obviously I had to eat ALLLL the soup! It takes it to a whooooole other level. Do it!! I just pour boiling water over them and call it a day! YESSSS broccoli soup and YES to clarifying that there is in fact NO substitutions for the cashews. I kind of hate when people ask :D Just sayin’. Pinning! Can you freeze this soup? Yep! I freeze it in mason jars. I can’t believe this bowl of green goodness is what stood between us. You’re a lorax. Whatever that is. Gorgeous photos buddy. Almost as gorgeous as me. Wait…what is a lorax? I don’t even know. The broccoli pictures don’t compare to the beauty that is your paleo face. … is there a sub for the cashews? ;) This soup looks incredible, lady! And I’m kind of mesmerized by the swirly design on the top. But cashews can give me some probs, so… no soup for me! Love all of these ingredients! Can’t wait to make this! Let me first say, I never leave comments on blogs. Never. I’m just too lazy. But every time you post a new recipe I think, ok I need to take a minute to tell her how amazing she is before she launches into super-stardom. A few months ago in a post-holiday haze I decided I had to clean up my diet and in searching for healthy, anti-inflammatory recipes I stumbled across your site. I have been making a bunch of your recipes over the past few months and without fail they have been amazing. I hate to say it, but I’m a food snob. I read cookbooks like regular books. I plan vacations around restaurants I want to try. And I am so often disappointed in people’s interpretations of healthy and vegan cooking. But you have a gift my friend! You aren’t fibbing when you say your recipes don’t taste like their components. I have tried a lot of these recipes out on my very non-vegan friends and family and only after they sang the recipes praises did I tell them what was in it….or rather what was not in it! (Me at a brunch the other day speaking to all the dumbfounded guests stuffing their face with the Vegan Chocolate Banana Muffins, “Seriously, they have no dairy in them. Nope, no added sugar either…”) Not only are you bringing some much needed soul to healthy cooking you’re an amazing and hilarious writer to boot! You are the Hummusapien. You do speak for the superfoods. And I will continue to listen, taste, and do as you say. Thank you for helping my husb and I get our health back on track. Thanks for the best comment ever. I must repeat—EVER. Like, I re-read this ten times before I proceeded to email it to my mom and dad. I still can’t wipe the smile off my face. I kid you not, it’s comments like yours that I make myself re-read over and over on days when I’m so freaking tired and don’t have the motivation to write a post. I really am so touched by your kind words. Thank you for actually reading what I say, making my recipes, and sharing them with your friends. It means THE WORLD to me. There’s absolutely nothing more rewarding than hearing that this little blog has actually helped some one else live a healthier, happier life. This sounds so tasty! I love how cashews are super creamy when added to savory dishes, but unforunately they are high FODMAP and I’m working through some digestive issues. I’ve been wanting to experiment with Walnuts in the way that cashews are used as the “cream” in various sauces/soups. Have you ever tried that!? Man oh man, that’s so interesting! I’ve never tried walnuts. I don’t think the flavor would be as mild, but it’s worth a try! I continue to be amazing at all the amazing things you can do with cashews!! I honestly don’t think there is a single dish that cashews can make more delicious! 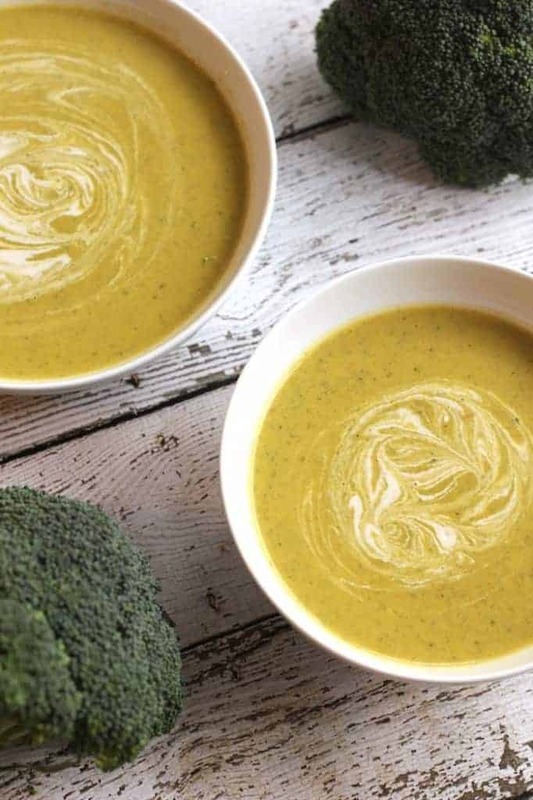 I love broccoli but I never make cream of broccoli because the recipes always call for lots of milk and cream, but yours sounds and looks so good! Gahhhh thanks, mah dear!! Cashews make dreams come true, it’s that simple. Omg I’m making cashew cream for a different recipe tonight and am going to make a double batch so that I can make this tomorrow! It sounds and looks so delish, I can’t wait to try it! Oh my gawd. So, I just made this soup tonight AND your vegan lasagna…did I mention that your site basically feeds me like every day of my life? The soup was JUST incredible. My 90 year old father just shook his dear curmudgeonly head when I asked him if he wanted to try it…then I asked him please. So he did. All he said was, ” it’s good”‘ and proceeded to eat a whole bowl. Now, I know you don’t know my dad but let me tell you what a score this recipe was for both you and me at that moment! And then the lasagna…my 15 year old daughter said, “you finally found a recipe I really love! I like it better than lasagna with meat”! I thought I must have died and gone to heaven. But no, just to my beloved Hummasapien blog. You are literally the only thing that keeps me going in my new healthy eating resolution. You are some sort of a food genius. And so adorable and witty, can you tell I am crushing on you/ your blog? Okay, I admit it! I can’t thank you enough for what you do for me and my family. I have a whole circle of people around me now who are also sharing the HummusLove. Keep up what you do and know what a huge impact your blog and your being have on so many levels! I have just stumbled on your blog for the first time today and I’m really enjoying it! This recipe looks delicious. Do you ever post nutrition information for your recipes? Thanks, Annie! So glad to have you! Nope, I don’t post nutrition info. Yay!! I’m so glad! That is totally acceptable. Either way, we will definitely be adding this to the rotation! My husband over-bought broccoli the other day, so I decided to make soup. I love using cashews as the “cream” and your blog entry was really entertaining! I just made this tonight – I followed the recipe to the letter (you made it so easy!) BUT…. it seems very bland. What are your thoughts on adding some herbs, like a handful of parsley, and maybe some tarragon? Hmmm that’s so odd that it tastes bland! I would add more salt, pepper, and nutritional yeast. Thanks – Pepper and salt are easy – will look at my local health food store for the nutritional yeast. This is lovely. My co-op landed me with more broccoli than I knew what to do with so I made this today. I added an herbed vegetable bullion cube and some nutritional yeast for more depth of flavor and I’m really pleased with the result. Thank you! I’m a produce junkie and got a little carried away with my broccoli purchase a couple of days ago. I love Cream of Broccoli soup, but the cream doesn’t love me, so I went searching for a dairy-free version. That’s how I found YOU!! I just made this recipe today and the results were outstanding! The cashew “cream” intrigued me. This will definitely be a new soup staple for me. I’ll be exploring your site for more yummy goodness. Thank you for sharing your talent! Not sure how to add a picture of mine but it looks pretty much like the pictures in the recipe! Definitely added to my go-to recipes for my son and I who are on a dairy free diet! Thanks so much ? Awesome idea to add a leek. Thanks for letting me know you liked it! I hate hate hate hate cashews (no digestive issues, just really dislike the taste). I may be the only person in the world who does, so my question is: is the cashew taste obvious, or is it hidden by the other ingredients? Other than the cashews, the recipe looks amazing! Thanks! ALEXIS. This. Soup! I’m going to have to come to alchemy from Cincinnati to give you the biggest hug ever for coming up with this. The ingredients are so simple, but I would’ve never thought to put them together and then purée it. I had my wisdom teeth taken out yesterday and did not do a very good job of prepping savory vegan foods beforehand (just some applesauce from whole foods, smoothie ingredients and muffins), and afterwards I was craving something salty. Five hours after surgery, I mustered up the strength to make this soup (love that it was all ingredients that I always have on hand so no chipmunk-cheeked grocery trip with my mother-in-law required). And let me tell you, it was WELL worth it. My new favorite soup (ever)! And I’d like to stress that I’ve been vegetarian for 15 years and vegan for two – since then I’ve made nearly every soup/chili in the blogosphere (seriously, I make at least one new soup recipe a week, even during sweltering Ohio summers) and this is just the perfect combination of healthy, simple and unbelievably good. I used my vitamix to purée it to a consistency between applesauce and mashed potatoes instead of making it pure liquid to accomodate my sutures, and it did not look appetizing, but I finished the entire recipe myself in less than 24 hours! It was the perfect size to blend in my vitamix 7500 – no batches required (I added the cashew cream in with the vegetables to help it blend easier). Love your personality, humor, recipes, stories, and YOU! I’ve been making your recipes for about a year now and have loved every last one (your baked spaghetti is a huge hit with my two year old). I cannot thank you enough for existing and making a wonderful resource for all of us to enjoy! Oops, I forgot to mention that I added nutritional yeast (about a tbsp) to each bowl for an extra punch of cheesy goodness and nutrition, but I also ate quite a few bowls without it and both were absolutely divine! So, I wasn’t joking when I said this soup is my favorite! I went back to make it again today, and halfway through the recipe – I realized I completely skipped step 3 (clearly too many painkillers from the surgery!) – I never added 5 cups of water or boiled the vegetables, I just through them straight in the blender with the cashew cream as soon as the 5 minutes of the broccoli/garlic cooking was up (this is why it fit into my blender with no batches). It was so good that way that I decided to skip the step again this time around. I read a previous commenter that said the soup was bland – I don’t see how that’s possible even with the added water, but doing it this way if you have a powerful enough blender may be the way to go. Thanks again Alexis, and I’m sorry being so confusing! You are so welcome, Brookelynne! Thank YOU for leaving such a thoughtful response. I love that you forgot the water–I bet it tastes AMAZING that way. Nice and thick!! Loved it! Added some nutritional yeast and a bit of cayenne pepper for a bit of a spicy kick and it was perfect! Can’t believe there’s no veggie broth in here – it’s so flavourful! Yay!! Isn’t it crazy delish? Love the nooch addition. Ive made it now and its soooooo tastyy)))))thank you!!! I just made this and it is fantastic! It is very easily to make and it is good for you too. I will definitely make this again. Thank you! just made this for the first time…amazing! Thanks for this recipe. I have a bulk amount of broccoli that I was looking to use and every other recipe out there for broccoli soup was just a bowl of cheese with a stalk of broccoli thrown in. This is much healthier and it turned out great! The most wonderful “cream of” soup I’ve ever made!!! Thank you for this wonderful and easy recipe. I’m going to try this with asparagus and then maybe butternut squash. Thanks for a wonderful recipe. My 88 year old Mom really loved it too. She is a brittle diabetic and loves soups. It is sooo great to make a “cream” soup that is healthy. This soup was delicious! I was thinking of making a cream of broccoli soup using cashew cream, did a Google search and viola, there was your recipe on my iPad! It was wonderful. I did add some ground sage and ground thyme and a shake of oregano. I just like lots of flavour…Never thought of the nutritional yeast, but made add it to the next batch! Gotta try your other recipes! Thanks Alexis. P.s. Love the name hummusapien. Did you blend the cashews with or without the water? Can I use coconut milk in place of the cashews? Hi there! Nope, I haven’t tried freezing it but I don’t see why that wouldn’t work. Yum! We’re having this for lunch and it’s great. Fan freaking tastic! Have made it more than a dozen times already. Grew too much kohlrabi this summer and threw a few in with the last batch … so good! My 1.5 yr. old granddaughter (raised veggie from birth) loves this so much we have to feed it to her last or she turns up her nose at everything else afterward. Am I the only one to question: Do you really mean 2 STALKS of celery, or 2 RIBS? 2 stalks seems a lot compared to the other ingredients. Hey there, I used two whole stalks! Hahaha, I just Googled “difference between celery stalk and rib” and I now understand why you asked this question! I just finished making this recipe using two ribs (not stalks) and it was delicious! The two ribs yielded about 1 cup chopped. The cashews give it a delicious creaminess and a hint of sweet as well! Because I have a Vitamix, I also chopped up the entire broccoli stalks and cooked them along with the onions and carrots. Boiling water is my favourite way to soak nuts in no time flat! Thanks for a great recipe! Hahah love that! I’m with you on the boiling water. SO easy. Would there be a significant difference if I use roasted cashews instead of raw ones for cashew cream? I loved this recipe. It was so super creamy and satisfying! My three year old and I just shared two bowls of it for lunch! Thank you so much! I’m thrilled to hear that, Rachel! Cashews make the world a better place. I hate to leave anything less than a raving review, but initially we found this soup kind of bland. :( However, after adding a vegetable bouillon cube, it was transformed! There were no leftovers for lunch. I wonder whether being a fairly recent convert to a mostly whole food, plant-based diet has something to do with it – taste buds somewhat desensitized and wanting more salt? I also made the soup with broth!! And it was still bland to my taste; I added nutritional yeast for more depth… and that made the difference i was looking for!! I also thought about adding some mushrooms to the vegies being sauteed. I topped with half a squeeze of lemon, dash of cayenne, and for the paleo/meat eaters, a put a few organic bacon bits. White carrots and blanched broccoli kept the color brighter I thought. Can buy blanched frozen organic broccoli at costco…2 bags is what the recipe calls for. I just made this soup last night and used veggie broth instead of water. IT IS AMAZING!!! I am freaking out over this soup!!!! Could not be happier to have found this recipe! I also bought stuff to make the creamy cauliflower soup. Can’t wait to try more of your recipes!!! How does this soup do being frozen? Easy to reheat? Bad idea? Thanks! ps…love your morning glory breakfast cookies!! Hi! I made this recipe yesterday & it is delicious! Any idea about calories? I divided it into six ~ 1.5 cup servings. Hi! I don’t calculate nutrition information but you can enter it into myfitnesspal! Okay. I saw that you had provided nutritional information for some other recipes, so I thought you may have it available for this one. No problem–I used to include it but have since shifted my views and decided it aligns with my perspective more to not include nutrition information. Thanks! This soup was so good and very easy to make. I omitted the oil, and added 1/2 cup of nutritional yeast to the cashew cream. I just made this soup!! Wow, absolutely delicious!!!!!! Anyone who is thinking of trying it will not be disappointed!!! Can’t wait to try your other recipes, the lasagne is definitely on my radar. 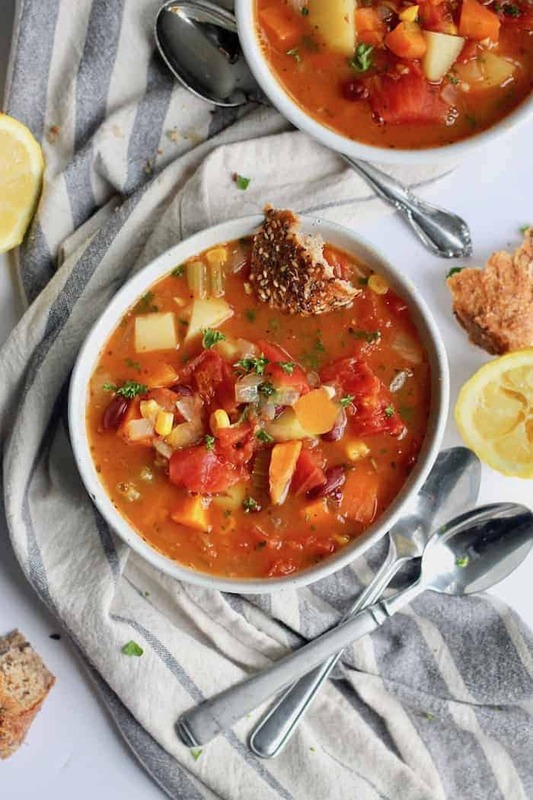 Just one question, the lentil soup that you mentioned in this post, the link doesn’t work and you have a few lentil soups on your recipe page, which one were you referring to? I topped with a pinch of cayenne and a squeeze of fresh lemon. Used white carrots and costco’s frozen organic blanched broccoli to keep it more green:) Very good!! I make this once or twice a month. My go-to healthy lunch, in a hurry. My only change in the recipe is I use vegetable broth instead of water. It taste like a way better version of ‘cup o soup’ from my childhood. Raw pecans in place of cashews work too. Thanks. This is one of my fav vegan recipes. Thanks for another great recipe. I like spices so I added a 1/2 tsp of oregano, thyme, cayenne pepper and smoked paprika. I also added 2 tbsp of nutritional yeast. I left some broccoli chunks in the soup while blending about 90%. The result was a delicious. I started a vegan diet about two months ago (for health reasons) and as a result my wife pretty much stays away from my cooking but she liked this soup. I have made four of your recipes now and I like them all. This soup is phenomenal. I cannot believe it’s dairy free. So glad you like it!! I just made this soup and it is so yummy!! Next time I think I will split the water into, half vegetable broth half water to give it a little more flavor, and I did add more salt. Love the creamy cashew texture . This will definitely be in my dinner rotation. Thanks for sharing!! I use veggie broth sometimes, too. Love that flavor boost! 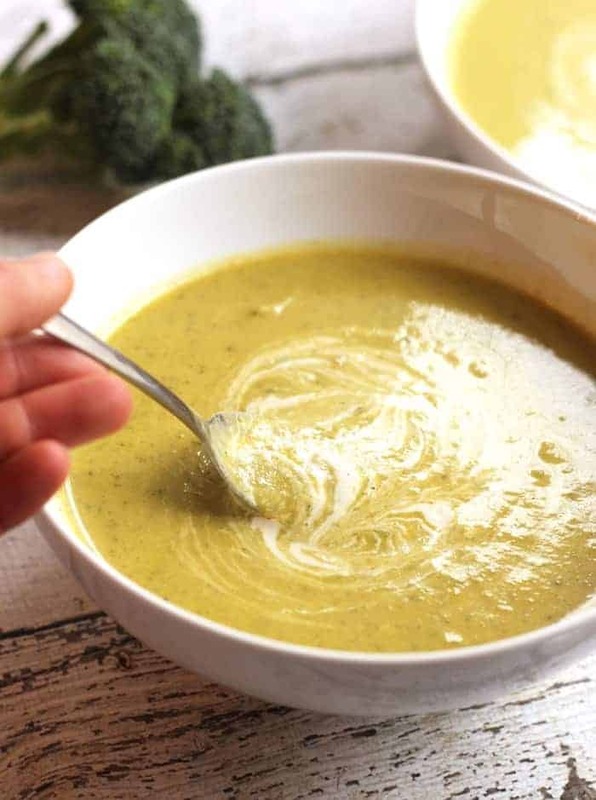 I was searching for a vegan broccoli soup and came across this recipe online. As I was reading my mouth started to water and could not wait to make it. Just made it 15 minutes ago and had to post a comment. It was absolutely delicious, very happy I found this website and I will continue to explore more of your healthy vegan recipes. Thank you! I tried to make this but it didn’t look as nice as your pic. My looks more carroty and the cashew cream was more frothy than anything. I followed the recipe to the letter (it’s the rule follower in me). What did I do wrong? I would like it to be more creamy. Are we just talking more cashews? Not sure how to salvage – taking it for my vegan niece for Thanksgiving. Bummer! What did you use to blend? If if looks carroty it sounds like it’s not fully blended? The cashew cream should be blended until completely smooth and creamy before adding to the soup. It should be thicker versus super thin. I’m honestly not sure where the frothiness is coming from, but yes, blending in more cashews will definitely thicken it! A blender…maybe I need to put it back in and do another round of cashews with a little less water. Or borrow a food processor from someone. Can that be done later? Late to the game on this recipe, but OH EM GEE. Seriously BEST broccoli soup recipe EVER. My family absolutely loved it. We had it with grilled cheese…haha! Vegan soup with grilled cheese. Anyway, THANK YOU for posting such a beauty! I made this tonight and it was amazing. Just made this for a snowy day in Denver. Absolute perfection and so damn simple. I love a recipe that calls for all the things I already have at home. Really good! I will definitely be making this again. Easy, fast, and very tasty! I made your recipe on my youtube channel Holli + Huckleberry :) thanks for sharing! Found the recipe and website through Holli + Huckleberry’s youtube video. Delish! Accidentally forgot the carrots and still good! I have a vegan friend coming for dinner tomorrow and I have decided this will be my starter. Loving the way it’s described and the use of cashews as a paste. Looking forward to eating it! This is SO good! I substituted the carrots for parsnips because I didn’t have any carrots, and it was really good! Also I didn’t add enough ginger @ the beginning, so added more at the end, and that made it probably how it was supposed to be. THANK YOU! Am anxious to try this cream of broccoli soup though i am allergic to nuts, chocolate and other stuff. So what should I use instead of cashews. I made this last night and it was delicious. I added a vegetable bullion cube (would have used home made soup stock if I’d had any) and a bit of lemon juice. It was good before these additions, and irresistible after. The teenagers went back for seconds. 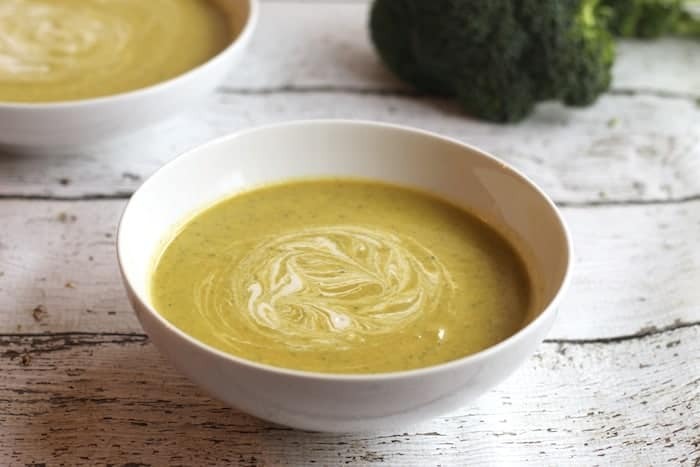 I have been on the hunt for a really good WFPB cream of broccoli soup, I cant tell you how many recipes I tried that ended up in the garbage. I vowedthis was going to be my last try!! So glad I tried this recipe, it was delicious, printed it out right away and added to my recipe book so I wouldn’t loose it. Awww thanks I’m so glad! Sounds great, but, as some others have bemoaned, I cannot have cashews! Would raw macadamias work instead? They’re pretty creamy and buttery…. Never tried it but probably! You know, I decided not so long ago that I wanted to become a vegetarian. Sometimes it’s hard to find a recipe that’s easy to make if you’ve never done it. But here I got to your site and was pleasantly surprised. Many recipes can be done yourself and it does not take much time. You know, it even motivates me more to eat right. Thank you for sharing, Bon appetit. I am cooking this today and am so happy to hear it’s been a success for so many. One thing- 16 ounces of broccoli isn’t 7 cups. I’ll go with the cup measurements ? Hi can I pkease check is this freezable? Or should I make the broccoli soup base and freeze that then defrost it when needed and adding the cashew mix? Thanks in advance – so looking forward to trying this! You can freeze the soup, yes! I just made this soup. It was easy to make and delicious! I made a big pot full and was wondering if it could be stored in the freezer. Have you tried that? I freeze anything and everything, yes! This soup is amazing! Simple to make, healthy and delicious. Thank you so much, Kris!